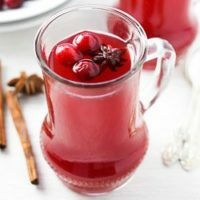 This holiday cranberry punch recipe is inspired by European Christmas drinks that you can find at holiday markets in many European countries. 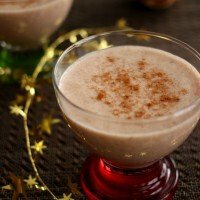 The best part of this recipe is that you can make a non-alcoholic and an alcoholic version and you don’t need to do any extra work. 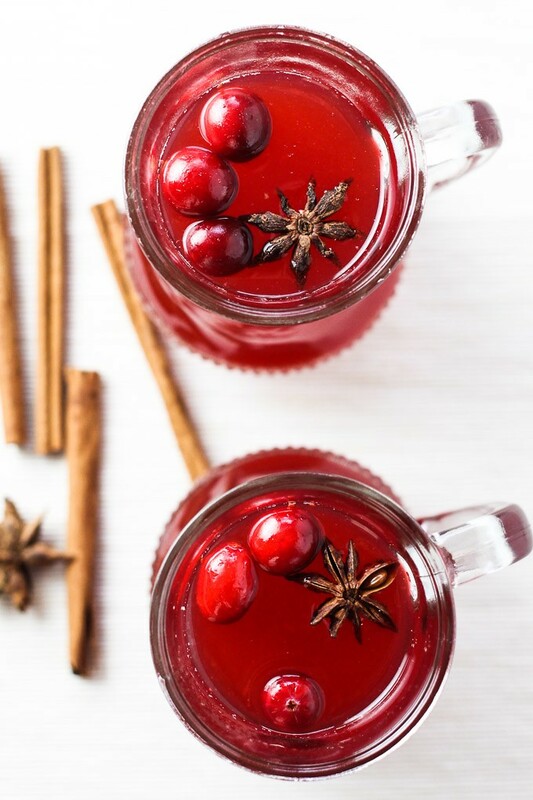 This holiday cranberry punch is infused with the aroma of winter spices with a hint of orange and should be enjoyed by a Christmas tree with the Christmas lights on. You can also put on your holiday socks if you are at home. (What? You don’t have any? You should really consider getting a pair because they are awesome!). This drink is quite easy to make because you can just put it on the stove top and do other things while it’s cooking. In addition, it will fill your kitchen with a wonderful scent of cinnamon. To make an alcoholic version, choose any kind of red wine that you like. If the wine is on the sweet side, you can try adding less sweetener to adjust the taste. 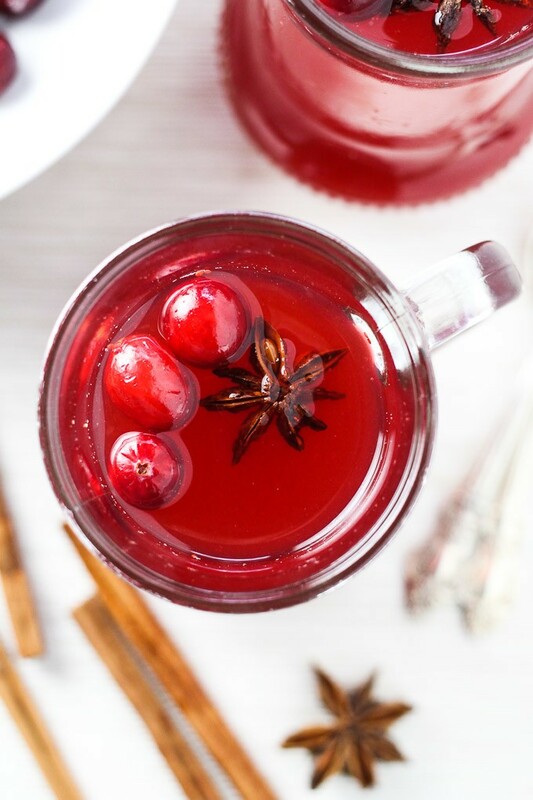 To make this drink look more festive, add a few fresh cranberries, a cinnamon stick, and an anis star to the serving. The non-alcoholic option makes about 3 servings. If a lot of water evaporates during cooking, you might end up with only 2. So plan accordingly, if you need more servings, just double the ingredients. The alcoholic option should yield about 4 servings. 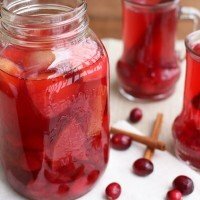 Try this holiday cranberry punch once and I am sure it will become your favorite Christmas drink. 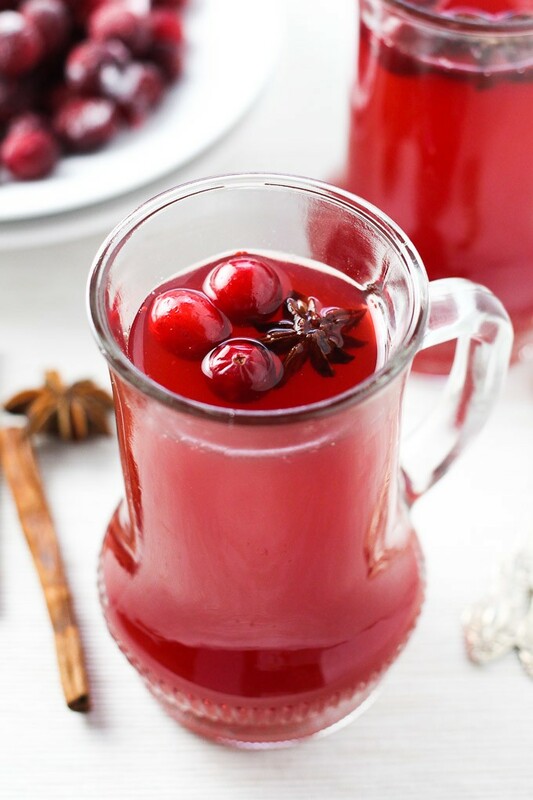 This holiday cranberry punch can be made with or without alcohol. 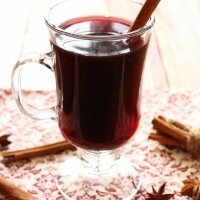 It’s delicious, very easy to make and will fill your home with the amazing aroma of holiday spices. If using fresh cranberries, wash them first and remove any that are soft. Put the cranberries in a medium saucepan. Add the water, cloves, anise star and cinnamon sticks. Bring to simmer on low-medium heat. Once the cranberries soften, press the cranberries gently with a spoon to release more of the juice. Cover and cook for about 15 to 20 minutes making sure the mixture doesn’t boil too much. In the meantime, zest the orange by scraping off a thin layer of the orange peel. (A microplane grater works best but you can use a regular grater too). Press out the juice from the orange. 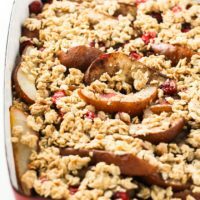 When the cranberry mixture has finished cooking, turn off the heat, add the orange zest and orange juice and let it stand on the hot stove for about 10 more minutes to allow flavors to blend. Strain the mixture to remove the cranberries and spices. Pour the cranberry punch back into the saucepan. Rinse the cinnamon sticks and place them back into the saucepan as well. Add the maple syrup and stir. 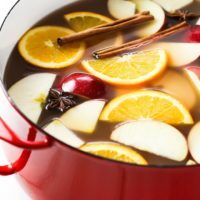 Warm up the punch one more time until it starts steaming but don’t boil it. If a lot of water evaporates during cooking, the punch can become quite concentrated. Taste it and add water if needed. Add the red wine and warm up the mixture, turning the heat off just before it starts to boil. 1. You can buy long or short cinnamon sticks. Short cinnamon sticks are around 3 inches long. If you have long sticks, use two instead of four. 2. Nutrition information is a rough estimate for 1 of 3 servings of cranberry punch without alcohol. This drink looks amazing! and what I like is that it is made with fresh wholesome ingredients. 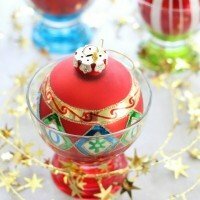 I’m looking forward to making this. Thank you for the post. And your site looks awesome too, how I like to cook. Thank you very much for your comment, Linda. I hope you’ll like the drink!